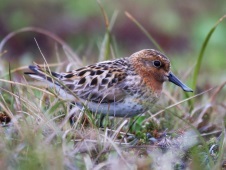 Along its flyway, BirdLife Partners are linking up under the leadership of the Spoon-billed Sandpiper Task Force to instigate conservation measures. These include captive breeding, awareness raising and helping local hunters find alternative, sustainable livelihoods. Spoon-billed Sandpiper Eurynorhynchus pygmeus has a broad distribution encompassing breeding grounds in the Russian Far East, and migration routes and wintering areas in South-East and South Asia. In 2011, the first steps to establish a conservation breeding programme for this species were successfully taken, led by Wildfowl and Wetlands Trust and BirdsRussia. At the other end of the birds’ flyway, in Myanmar and Bangladesh, conservation teams are stopping the killing of Spoon-billed Sandpipers by helping hunters to set up new sustainable businesses. Along the flyway, BirdLife Partners are linking up under the coordination of the Spoon-billed Sandpiper Task Force to effect change. For example, BirdLife’s China Programme, the Hong Kong Birdwatching Society (BirdLife in Hong Kong) and the Wild Bird Society of Shanghai have been working at one site, Rudong, thanks to a grant from Disney’s Friends for Change. Conservation education at local schools and awareness-raising events have helped to increase understanding among local communities of the importance of coastal wetlands for migratory birds and people.